Hello and welcome to the Daily Marker 30 Day Coloring Challenge Blog Hop! Our dear friend Kathy Racoosin is the mastermind behind this fun challenge. Please read more about it on her blog The Daily Marker. So many great friends and companies have teamed up in support of this challenge, we hope you will join in on the fun too! This challenge was especially good for me because I had minor surgery on both eyes about two months ago. I've held off creating in that time so my eyes could heal properly -- plus I wasn't able to see well. Now that I'm almost all healed, I have found it hard to get back in the swing of things. This challenge has forced me to break out my Copics and coloring pencils again and just dive in by combining the two mediums. I have always found it difficult to shade with Copic markers. Especially with smaller images, shading can be quite difficult. I am experimenting with basic coloring with Copics then shading with colored pencils. I have found that I can really get into the tight spots and do control shading with the colored pencils -- something I wasn't able to do with Copics. How about a sneak peek of what's coming up in our June release? See what I mean about the shading? These images are pretty small and I was able to get some good contrast. I'll need more practice since I'm super rusty, but I challenge you to try something new too! How about a $25 gift card to the Mama Elephant store to one commenter below! The next stop on this mega hop is Neat and Tangled. Happy hopping and happy coloring! I have been experimenting with the same thing recently! Oh wow! Looks like a fun release for June based on your sneak peek. The shading looked fabulous! Great incentive to color everyday! I am in love with the kitty cat in glasses!! Your coloring is so beautiful and so is the images!!! I love the combination! I struggled with the same thing when trying to shade the tiny images. I am going to try this! Maybe when I color the million little monkeys I have stamped! Love the books and the cutest little animals. That is a great idea to do shading with colored pencils on top of copic markers. I will have to try that with my SN markers or tombow markers. Love the idea of mixing media- I don't think to do that, and it's such a smart way of adding shading especially for itty bitty images! Loved your card. The pencil shading really finishes off the images. Must give this try. Can't wait to see the June release. Your shading looks perfect! Love this cute card! Your card made me smile! I do love colored pencils, but still need practice using them. The lil glasses on these characters are so stinkin' cute!!! Looking forward to the June release as well. I love your idea of shading with pencils! I will have to give that a try sometime during this 30 day challenge! These cats are so cute with those glasses! :) I love them! I love the super cute critters and shading! That is whee I need to continue to practice. I like your critters. Shading with pencils is new to me. I think it will take a while to learn. Glad you let your eyes heal! Lovely coloring ! I hope you recover soon and get to enjoy coloring more.I do find adding details with pencils to Watercolored images adds more interest to them. Awwww, these kitties are adorable. You're right about the contrast - it's perfect on these little guys! Aww love the sleepy little kitty so cute. I love the idea of mixing the copics and the prismas. I have just started buying copics and am still learning how to make them work for me! Wishing you a speedy recovery. I too have started trying copics and colored pencils, I'm sure I'll get better at it. This card is so cute! So cute !!!! i love your coloring ! Thanks for sharing and the chance to win ! I'm usually too heavy-handed & don't know when to quit. Great shading with pencils. Continued good healing to you. So sweet! Can't wait to see the new release! Oh, how fun! These look great--I love the books. Best wishes for a full recovery! Just love the glasses on the animals and even the apple!! What fun this is. I love your coloring and wish you the best with your eyes. Improved vision is wonderful. This card is too cute. Your shading really added to it. Thank you for the inspiration. Super cute card, and the shading detail really makes these little images pop. Ooooh, I am liking this sneak peek, so cute! Funny you should mention being "rusty" in your Copic colouring, as that's exactly what I said under my "Day 1" picture on Instagram yesterday - I have been mostly stamping and colouring with my ZIGs recently, but for the beginning of the challenge decided to play with the Copics a bit, and boy it was a bit of a struggle! But I'll keep practising! :-) Thank you so much for being part of Kathy's wonderful hop and challenge! I'm glad to hear you're mending well - I hope things settle down and get back to normal soon. <3 Hugs coming your way! You did a great job on the shading! You’re definitely on your way to getting good shading on those images. Thank you for sharing and inspiring us to get back to coloring! Your new eyes are working great! I need to practice my shading with pencils, too. Your coloring is almost as fun as the card itself! These are sooooo adorable! I may need that set for cards for my 3 year old granddaughter with glasses! I think your colouring looks good! That little apple with glasses is the cutest! I love this stamps! The coloring is great! Adorable image - thanks for the sneak peek! Such a cute image and I love the coloring! Glad you are healing well and I love the shading! Those critters are so cute with their glasses! Thanks for the sneak peek. I, too, have trouble shading with copics, so I'm going to try using your idea of colored pencils. Books! Characters with glasses! Oh, I'm so excited for the June release. <3 I've seen the combination of Copic coloring with colored pencil shading a lot lately, but I've yet to try it myself—today seems like a good day to jump on the bandwagon. Thanks for the inspiration! Your coloring with copics and adding details with colored pencils is lovely! Thanks for the sneak peek of what's coming up in the June release. The images are absolutely adorable! I am guessing this is a bookmark set? Such a cute card. I like how you achieved the shading on such small shapes. These little guys are just adorable!! Love the little specs!!! So glad to hear you are back to crafting again. Wishing you the best as you continue to recover! Super cute stamps!! I think your coloring looks great!! Love those geeky looking animals! Your stamps are great, I’m looking forward to seeing the next release. Oh my god is that a guinea pig? So cute! Happy your eyes are healing. Love the card. Happy continued healing! I love this card and I like the idea of shading with pencils. Cute card. I also like alcohol markers with colored pencils. Someone else along the hop gave me the same idea. I’m starting with alcohol markers “spectrum noir”. And then shading with colored pencils, which is my preferred medium for coloring. So far so good. Yours look awesome. Simple cute and lovely images. Pencil shading is my favorite. Never thought of trying the two together. Must give it a try! Love the new images! So cute. I love the idea of added coloured pencils to add shading. I do feel that I have more control when colouring with coloured pencils. Hope your eyes have healed well. This is so cute. Love these designs. I don't use Copics, but love to color with colored pencils and watercolors! Your colors look great! So adorable! I love using Copics and colored pencils together, too. Thanks for the inspiration and for your generous giveaway! WOW! These are too cute! Thank you for the inspiration! The apple is my favorite! Wonderful sneak peek... love the stack of books. I'm sorry to read about your recent surgery. It's really hard to not create while we go through certain times with our Bodies! Hope you heal up beautifully! Wishing you a speedy recovery! Absolutely love that stamp and die set! Thanks for the inspiration! Thanks for inspiring me to keep at it. I'm still a beginner at using alcohol markers and am trying my best to learn shading! Oh my word!! This is so cute!! Hope you feel better soon!! thank you for the shading lesson. I never thought to use pencils to detail over something stamped and colored with markers. I will definitely try this as your samples look so remarkable. Aww sweet images and beautifully coloured! I use watercolour pencils, so I'm going to try ordinary pencils to add a bit of shading. Thanks for the colouring lesson. Cute card! Great suggestion to use the colored pencils in tight spots for shading! So cute!!! I have been experimenting with watercolor markers and pencils. I have never been good at shading and adding dimensions to my coloring. You did an awesome job. Love the idea of shading with the pencils, you’re right it’s really hard to get to tight spots with an alcohol marker. I’ve tossed a lot of images because I didn’t like the results. Thanks for the tip, I think it’s going to save some frustration and paper too! As a librarian seeing such cute animals around a stack of books warms my heart. I'm looking forward to trying some colored pencil coloring soon. Those animals with the big glasses are so adorable. On my wish list for sure. Cute coloring. Cute stamps, and your colouring is terrific! very cute!I'll have to try the marker and pencil combo. Very cute! I will have to try using colored pencils for shading with Copics, especially for small images. Glad to hear that your eyes are healing! Great shading on these little guys - they are super cute! This image is so cute! Glad to hear how this challenge has encouraged you to colour again after your surgery. Adorable images! I have trouble shading small images with alcohol markers and have played some with pencil shading. Your shading looks fantastic here! Hope your eyes continue to heal well. SQUEAL!! BEAUTIFUL Card!! I LOVE the Images and Coloring!! THANKS for sharing and have a FABULOUS WEEK!! Too many great things about this card for me! I love animals & have a cat that is white! Great card! Thanks for sharing! Loving the detail you get when combining coloring mediums! Totally understand, I've gone through some medical stuff and had to put crafty goodness on the back burner and it was no fun! Glad your getting back to coloring! So glad you participated... the images look lovely and adorable. I love that the cats and even the apple are wearing glasses - too cute! Your shadingnlooks good, Im going to have to give that a whirl. Glad your eyes are healing, it's no fun to be away from the craft we all love! those little critters with the hugs glasses are the cutest ever - and wonderful coloring - i like to shade with colored pencils too. Glad you are healing up nicely and are able to get back to coloring. This is just the Sweetest card!!! Hope you feel better soon!! Ahh this is just TOO cute!! Great inspiration! This is the cutest card! I like to color and I love to read! Very cute images and I think you coloring is great. Such cute images on your card!! I like your idea of combining Copics and colored pencils! Glad you're healing time is almost over!! I love the idea of combining Copics with colored pencils, and must try it!! Thanks for the inspiration! And the sneak peek is adorable!! Adorable critters!! Love the glasses and the books!! Great coloring. Ooh, I love this sneak peek :) Adorable images and great coloring! Awww, such cute images! I too struggle with shading on small images (and sometimes large ones). I'm going to give my pencils a go next time for the shading. Thanks for the tip! Love these animals, and I'm glad your surgery seems to have had a positive effect! I think the coloring is great, and I love the coloring challenge because it gives me permission to just go for it and not care if I get a card out of it in the end! Thanks for sharing with us and being so generous and supporting Kathy and the challenge. How sweet! I just love that cute apple with the glasses. Thanks for sharing your project. That sneak peek is so cute! Those glasses in the adorable critters is just beyond precious! Can’t wait to see the whole this. Copics and colored pencils combined raises some interesting options. I love your card! Great idea using pencils with the Copics for shading. I will have to try that! Hope your eyes are completely healed up. This card is so cute. Cute card, great idea for the shading. Hope your eyes keep getting better. That sneak is the cutest! We are huge book lovers and I think I'm going to need this one! wow so cute and adorable. Super cute card! I love your colouring! I hope your eyes heal quickly! Thank you for the awesome giveaway! So cute! I love their adorable glasses. Wishing you continued healing! I’m so happy to participate this time. Love your coloring on the Little image. You don’t seem rusty to me. Thanks for the tip to use coloring pencils when trying to shape the little images. I sometimes have a hard time with those. Cute as can be. Love the kitty on the books. Kryssi, you have no idea how reassuring it is to hear a "professional" admit to struggling with a skill that many of us struggle with too! Best of luck with your continuing eye recovery!!! And eager to see the rest of the new release! Oh,cute images! I think your colouring is great. Love the coloring. What a great idea to combine copics with pencils... I'll definitely be trying that! Love the cute images and how they are colored! I also find it hard to get contrast for small images, really impressed at yours! Great card! Love your shading and coloring and cute images. Glad you’re healing well and awesome coloring!! I can’t wait to see this full new stamp set. So cute. Adorable images! Cats and books - two of my favorite things! I'm just learning to use markers so blending and shading is a little scary for me. I like your idea of using the colored pencils for that, especially with small images. I love this stamp set. Looking forward to it's release. Continue healing. Such an adorable card! Can't wait to see the June release! Oh this is ever delightful! Those big glasses are so sweet! And a stack of books that high? My dream! I love the sneak peek (and your shading!) Well done! Oh, shading is what I am trying to improve at the moment. These are sooo cute! I need to try colored pencils over my copic coloring too. I hope you are at 100% soon! Your coloring is so pretty. Cute card! Oh so cute. Your images are the cutest. I love the coloring on them. That's one thing I love about your cute tiny images is not a lot of coloring but what coloring is done give so much life to them and can create awesome scenes. I love how they go with other sets to expand your card creations. Glad to hear that your eyes are improving because I'm sure you were itching to get back to making cute cards. I love this design so much..and is that a hamster with glasses?!! Eeek! What cute images. Perfect to make bookmarks for our local library summer reading program. Your shading is fabulous! I’m really excited about the new release. I love that they are wearing glasses. I think you did a wonderful job coloring. I like that you combined the two mediums. This is something I want to try soon. YAY for getting back to crafting finally, and happy recovering! I'm trying watercolors in embossing stamp imagines and I really love It a lot!!!! I just love what you created--stunning. I have always been intimidated by coloring but recently purchased some Copics and am starting to enjoy coloring. I need to continue to practice to get better at it but will eventually get there. So glad to hear you are healing and able to get back into creating. I love these images. Some of my favorite things....kitties and books. I have been trying the copic and pencil route myself lately as well as using my pencils over watercolors. Thanks so much for sharing your beautiful card and the sneak peek. Kryssi, this is an adorable image and I think you did a wonderful job on the shading. I too find it hard colouring/shading small images with Copic's, however, I don't own any large ones so I look at it as a challenge to myself to learn with what I have. If I can eventually learn on small images then it should help prepare me for when I get larger images to play with. I hope your eyes heal fully and that you are feeling like yourself soon. Coloring with copics are difficult even on larger images, and especially challenging on smaller ones. Thank your for the challenge and inspiration! Enjoyed the fact that you use pencils with comics....I use zigs and have the same problem.....will try! I hope you feel better. My eyesight is not the best too so it worries me to lose the ability to color which I enjoy very much. But I believe that if the talent is innate in you, no matter what the struggles are, that talent is still there.-Maria Giselle B.
Glad your eyes are healing. Cute card and thanks for the tip on shading with colored pencils. Feel better and definitely give a lot of rest to your eyes. My mom also had surgery to her eyes and she needed a lot of rest. I love your card and I do like the shading with the colored pencils. Stay blessed and hope you feel better...loved your card...thanks for sharing!! Glad you were able to color! This is such a sweet and clean card! Love it! Wow! how cute are those guys! I always love your stamps and these ones just look awesome! Can't wait to see the rest of them!!!! OMG! These critters with glasses...I need them in my life! Super sweet card! Such a cute card. Glad you are healing from your eye surgery. and to craft. thanks for sharing. I love the glasses, super cute cards! Cute specs! I need to revisit shading with pencils...I haven't done it in ages. Hi, Glad your feeling better, cool card, love the glasses. Glad you are on the mend! 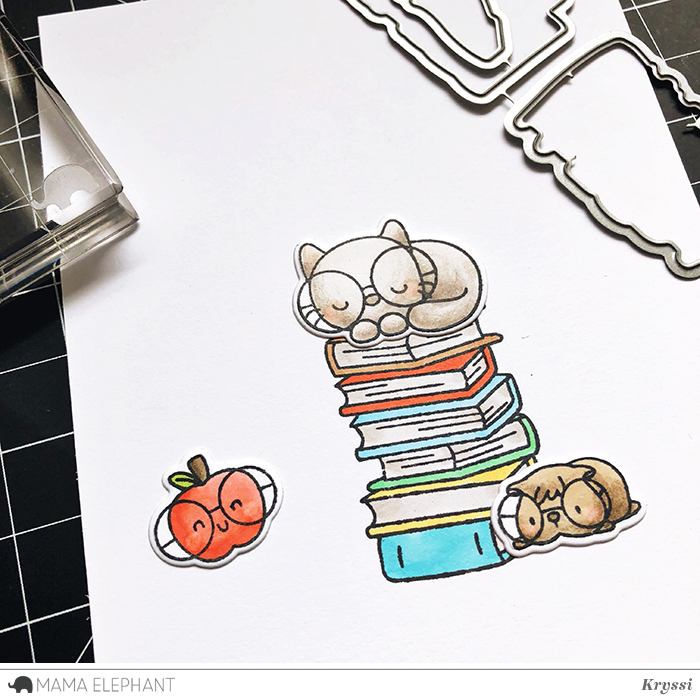 The sweet creatures and those books are too cute! Such cute images! Hope your feeling much better! Cute card! Thank you for suggesting using colored pencils to shade. I'm new to Copics & shading is challenging but I'm going try using my pencils. Glad you're recovery is going well. I have trouble shading with Copics too. I never thought of using colored pencils with them! Thanks for the tip! Can't wait to see this new release!! So sweet! I'm going to have to try shading with pencils now! I'm so glad the Coloring Challenge is an incentive to get you back into coloring Kryssi. I hope your eyes heal quickly and fully. Great work on your coloring and card. I need practice with shading also, and your suggestion to use pencils on top of alcohol markers is one I'm going to try. Thank you. What a great idea...I am really looking forward to this stamp set, too!